The origins of the man-made fiber (MMF) industry are found in the first commercial production of artificial silk using cellulosics by De Chardonnet in France in 1892. Regrettably the business declared bankruptcy in 1894! However, not to be discouraged, the industry continued to develop other cellulosics and acetates until the arrival of nylon, which was discovered by Wallace Carothers at DuPont in the 1930s. His discovery brought the first truly MMF to the market. Initial applications including military uses during World War II and replacing silk in women’s hosiery. Nylon was followed by the ICI development of polyester, discovered in the early 1940s by two British scientists working for Calico Printers. From these early beginnings the MMF industry was born, and through continuous development it recorded demand in 2014 of 55.2 million tons (122 billion pounds) of synthetic fiber, in addition to man-made cellulosic fiber demand of 5.2 million tons. The natural fiber industry, including cotton and wool, has a demand of 25.4 million tons. he graph also shows the continuing dominance of polyester going forward, as calculated by England-based PCI Fibres in its forecast out to 2030. Polyester demand passed that of cotton in 2002, and has continued to grow at a significantly faster rate than all other fiber types. Polyester is dominant, but nylon, the oldest MMF, still plays an important role in the fiber business with 4 million tons of global production in 2014. Production is more broadly based by regions than for polyester, and the China, India, Southeast Asia group accounts only for 52 percent of total nylon fiber, with the Americas contributing 20 percent. Nylon has developed into a niche fiber, in that it is focused on a limited number of end uses, but some of these are quite large markets. Cellulosics have been a surprising success story over the past 10 years, primarily through gains in usage of viscose rayon staple fiber as both spinning fiber for apparel and in nonwoven end uses. PCI Fibres provides forecasts of production and mill consumption in its annual World Synthetic Fibres Supply/Demand Report (Red Book). 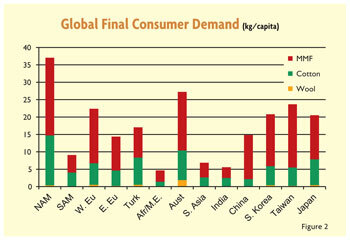 In developing these forecasts it is important to look at regional patterns of consumption at the final consumer level. Consumer demand ultimately drives production and mill consumption. 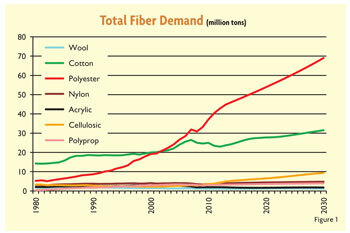 In the 2013 Red Book, it was determined that in 2014 the world final consumer demand for all fibers averages 11.4 kilograms per capita (kg/capita) (See Figure 2). Volumes vary from North America with a high of 37 kg/capita; to Africa, the Middle East and India at 5 kg/capita. This write-up is based on Carmichael’s presentation given at the 2014 Textile World Innovation Forum.